A must-read if you think you hate to cook, are intimidated by cooking, or just want to get more comfortable in the kitchen. Photo © Anita L. Arambula. Used with permission. 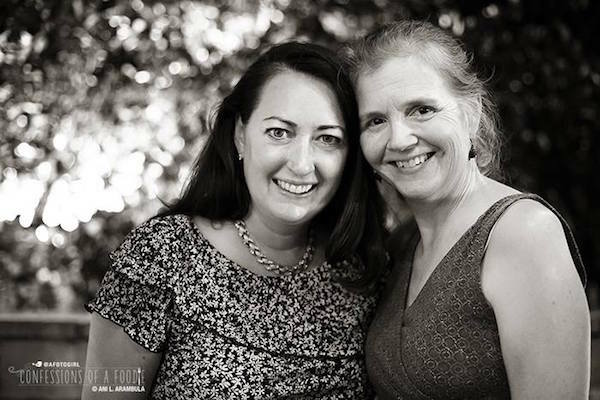 I had the pleasure of meeting Kathleen Flinn at an author dinner in San Diego when she was promoting her book Burnt Toast Makes You Sing Good. I bought her second book at the same event: The Kitchen Counter Cooking School: How a Few Simple Lessons Transformed Nine Culinary Novices into Fearless Home Cooks . I found this book to be moving, inspiring, and truly important. 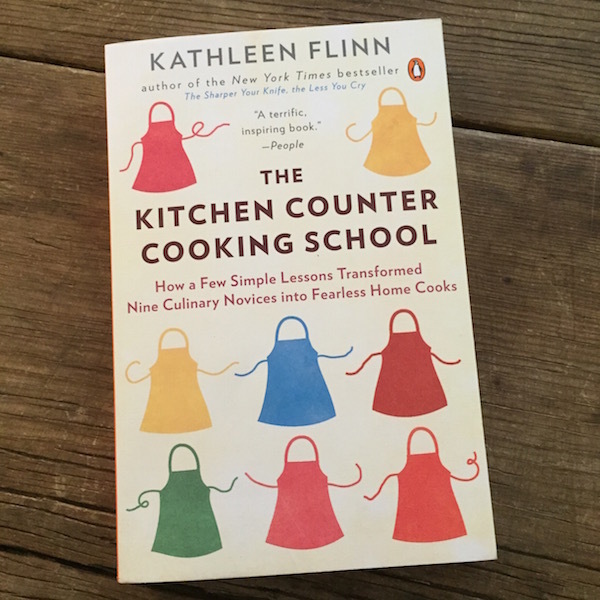 Flinn took nine novices, people who were barely cooking or mostly making processed food, and led them through simple lessons to teach them how to be comfortable in the kitchen. She is a born storyteller, so every character comes alive. You feel the heat in the Seattle kitchen. You cheer for each woman as she makes enormous strides in confidence, personal growth, and yes, cooking. Flinn began the project with a home visit, where she documented their kitchen, pantry, and freezer and had them make her a meal. At the end, we visit each participant again, and the changes each has made is impressive on many levels. The book follows Flinn’s journey. After graduating from Le Cordon Bleu in Paris she returns home to Seattle and tries to figure out what she’s going to do next. A chance meeting in the grocery store led her to begin researching why people have stopped cooking. That led her to create this class, run an ad on Craigslist for participants, and enlist her friends and colleagues in Seattle to help. After introducing the participants through their home visits, each chapter details one lesson. Flinn is an excellent researcher and food writer, so she packs the book full of informative details about cooking, food production, and why home cooking fell by the wayside for so many people. 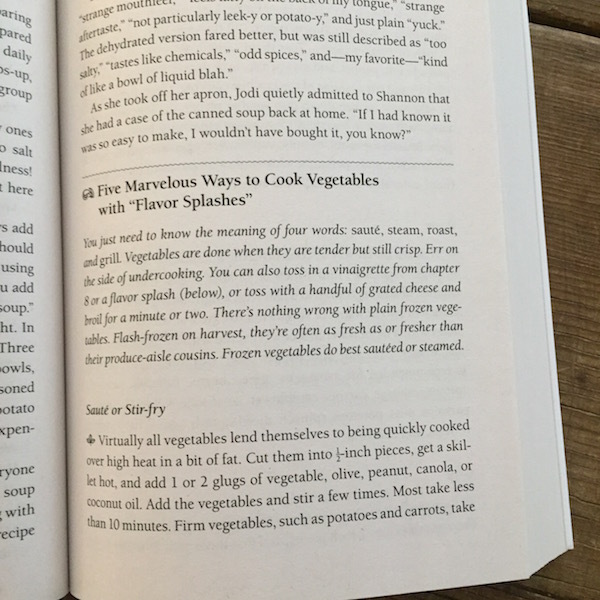 The book includes 21 helpful basic recipes, plus an additional 24 variations, such as flavored oils, flavor splashes, and flavor profiles. 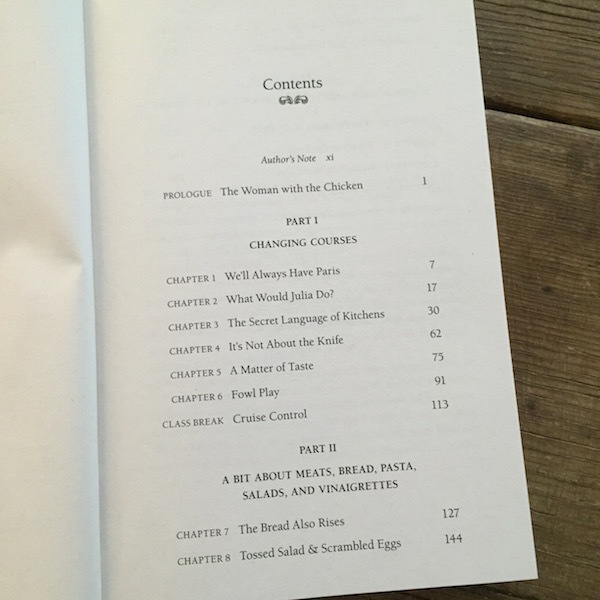 Each recipe ends the chapter and directly relates to the lesson. In the knife skills chapter, the students cut up 30 pounds of zucchini, after which they made rustic Italian farmhouse zucchini sauce with penne. Other recipes include five ways to cook vegetables, basic roasted chicken, and Mike’s yellow cake with chocolate frosting. Great storytelling, highly informative, inspiring. Check out her knife skills video here. Recipes were not coded for special diets; nutritional analysis is not provided, which would be helpful for low-sodium eaters. Anyone who wants to learn how to cook or become a more confident cook. If you liked Tamar Adler’s An Everlasting Meal, add this book to your reading list. Vegans will want to skip the meat chapters. Required FTC disclosure: I purchased one copy of this book, and one will be provided by the publisher for the giveaway on May 29th, 2015.